Mirrors are a great thing, don’t you think? It is hard to get ready and presentable without a mirror. If there is no mirror, a man can easily miss a spot shaving, and a woman can easily misapply her makeup … and goodness knows we do not want that! While many of us spend lots of time in front of the mirror, checking on our physical appearance, how much time do we spend in front of the mirror of God’s Word, checking on our spiritual appearance? How much time do we take each day asking God to search our hearts and show us what blemishes are present in our lives that need to be confessed and forsaken? The Bible is surely not like other books. We read other books, but the Bible reads us. God promises, “He who gives attention to the word shall find good” (Proverbs 16:20). Let me encourage you as I encourage myself: keep your nose in the Book. We speak to God through prayer; and God speaks to us primarily through His Word. When we get away from daily Bible reading and Bible meditation, we begin a slow fade in our Christian lives. We begin to lose and leave our first love, a problem the Ephesians had in their walk with Jesus (see Revelation 2:4). Read five Psalms each day. Pray the prayers from Psalms back to God. Read one chapter of Proverbs each day. There are 31 Proverbs, one for each day of the month. Read one chapter of the Gospels each day—start in Matthew 1 and go until John 21, then repeat. It is in the Gospel accounts that we see Jesus most clearly. Read a chapter from the New Testament (the epistles) and a chapter from the Old Testament each day. Let God expand your knowledge and understanding of Him from Old Testament times to New Testament times. The goal of Bible study is not to become a walking concordance or the Bible answer man (or woman). The goal is to draw closer to the King, to hear from Him and RESPOND correctly and appropriately to Him. When the Word convicts you of sin, confess it and repent of it. When the Word tells you something to do, do it! When the Word reminds you of His great love and faithfulness, you praise Him and bask in His love and faithfulness! Jesus said, “If you know these things, you are blessed if you do them” (John 13:17). Blessings from God come not from knowing what He says, but from doing what He says. I know how to lose weight—diet and exercise. It is in the doing where I find the challenge. May you and I truly be doers of the Word and not merely hearers who delude themselves. May we walk by faith and not by sight. May we remember that He really does love us and will provide for us, all the way to glory, as we do His will. P.S. If this email spoke to you, I would love to hear about it. Email me here. Jeff Schreve founded From His Heart Ministries, www.fromhisheart.org, in 2005 with the vision to reach as many people as possible with the good news of God's love. Jeff believes that no matter how badly you may have messed up in life, God still loves you and has a great plan just for you. He broadcast on radio, TV and in the internet around the world from his pulpit ministry as Pastor of First Baptist in Texarkana, Texas. This ministry is completely listener/viewer supported. It continues only through the faithful and generous gifts of people like you. Pastor Jeff takes no income from this ministry. All gifts go to further the broadcast. 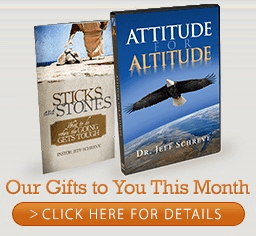 Sticks and Stone: What to Do When the Going Gets Tough, plus the 6 -message thought-provoking CD series - “Attitude for Altitude.” Click for more information.